PRODUCT: #L175, 1-3/4 in. ID x 12 in. Riser, fits 1-1/4 in. pipe. 4 Lb. Lead. Pipe Flashing, 12x12 in. Base. Price/Each. SIZING: Fits 1-1/4" pipe (1.66" O.D. penetration). L-series lead flashings provides a watertight seal completely protecting roof penetrations and are recommended for all types of round roof penetrations. The heavy duty grade, 4lb / sq.ft. material assures the longest life. The all-lead seamless riser flashing provides a watertight seal and completely protects the penetration. Lead flashings have superior characteristics such as malleability, corrosion resistance, malleability, expansion and contraction and are suitable for all climates. These characteristics eliminate the need for penetrating fasteners. Without the need for fasteners, the electrolysis and galvanic corrosion is eliminated. The cylindrical lead riser is the same shape as the penetration so the riser does not need to be reinforced. Overall you have the best possible product and problem free installations. 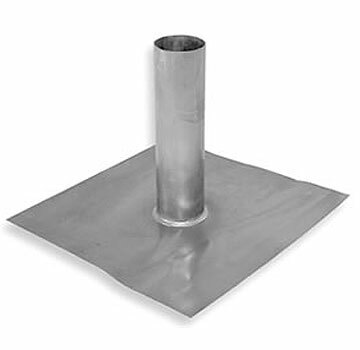 Adjustable flashings are NOT required -- these flashings are designed to work on roof slopes up to 8 degrees. Special flashings can be ordered for greater angles and with higher risers. We also carry adjustable flashings. RELATED ITEMS: Counter Flashing, stainless steel hose clamp and appropriate caulking sealant.